Chalet Cristal 5, Val d'Isère is situated on the third floor of this beautifully appointed chalet. Its excellent location and great design, with its wood and stone finish and Savoyard charm, make it the ideal home for our Val d'Isère guests. Chalet Cristal has a superb location, situated away from the main road in Val dIsère (1800m). It is only 150m from the La Daille telecabine, the Etroits chairlift, and the "Funival" a high speed funicular that carries skiers to the top of Bellevarde (2800m) in just a few minutes. From there is a huge choice of pistes including easy access to Tignes. You can ski back to within about 100m from the chalet, the same point as the Val d'Isère World Cup Downhill finish. 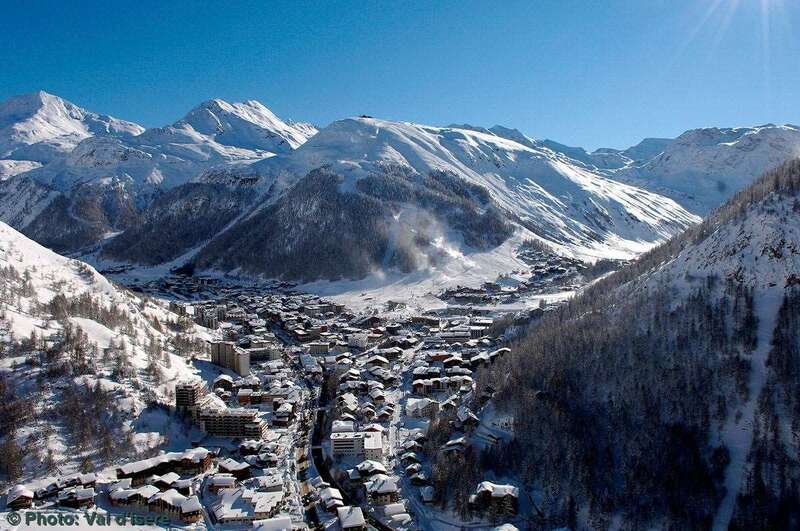 The centre of Val d'Isère is a short walk from Chalet Cristal 5. Alternatively you can use the free bus service that operates around Val d'Isère throughout the day and continues until 2am. The nearest bus stop to Chalet Cristal is only 100m away for the short ride to the centre of town. Cristal 5 has five spacious bedrooms all with full en-suite facilities and oak flooring with room 4 giving onto the balcony. The white-tiled bathrooms with lit-mirrors and heated towel rails are well designed and comfortable. The attractive open plan lounge and dining area has traditional-style furniture and heavily-beamed ceilings with plenty of comfortable seating around the wood-burning stove, creating a warm and welcoming place to relax and unwind. French windows open onto a South West facing balcony creating a pleasing sense of light and space and a great outdoor space for guests to enjoy. The chalet has modern accessories such as a flat screen TV showing British channels, a DVD player for your enjoyment as well as free Wi-Fi internet access so you need never feel out of touch. The chalet Cristal 5 hosts live in on the ground floor. Rooms 1, 3 & 4 can take a cot. If booking the whole of Chalet Cristal 5 an additional child's bed can be put in room 3. Cristal 5 is on top floor of traditional large chalet building. Due for refurbishment but comfortable with enough chairs in living area for everyone. Food very good - thank you Jason. And wine excellent. Views of nearby La Daille bubble lift which connects to Val , Tignes, etc. so good location even though not in Val centre. Frequent buses. Could have done with an arrival briefing/proper welcome chat as didn&#39;t know on last day Ski Hire shop did not open till 3.30 after lunch siesta closure. Ski Beat staff and Resort Manager, Josh, excellent and very obliging. Skibeat offer a good product at a good price. And Iglu booking staff efficient. Transfer time from Lyon is not 3.5 hrs, as advised, in my experience on a good day it is at least 4 hrs and getting to resort we experienced 5.5 hrs this time! But that was due to exceptional traffic problems. Val is very popular with the Brits.